Here is a well-designed employee information PDF template that is suitable for all businesses. If you are running a business or working in an HR department that needs to collect and manage information of the employees, this PDF template will highly ease your process, as you will be able to view each employee's information in one interface. 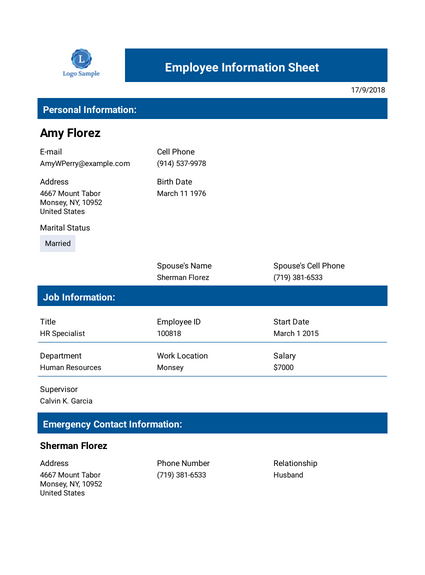 This template which has made by using JotForm's new PDF Editor divides the information of the employee in three sections in order to keep the information more manageable. These three sections are; personal information, job information and emergency contact information. Personal information section has the basic personal information of the employee along with their contact information. Job information section includes employee's salary, department, start date with their employee ID. Lastly, emergency contact information section has the basic contact information of the employee's chosen emergency contact. You can get time off requests from your employees by using this time off request form template that allows collecting personal information such as name, email, contact number, and time off details such as time off start date, time off end date, start to work date, reasons of time off request and additional comments. This employment contract template states in clear and explicit terms the conditions of employment. It outlines the duration of employment, employees’ compensation or remuneration, and general conditions of service.